Two new Liebherr LRS 545 Reachstackers of the latest generation will be soon active on the Port of Lyon. The first device was handed over in a ceremonial act during the inauguration of the Rognac branch and will be followed by the second before the end of the year. These acquisitions are the result of the desire of Lyon Terminal SA to invest to advance the progressive technical expansion of the port, whose traffic is constantly increasing (approximately 137 000 TEC in 2017). The LRS 545 from Liebherr has a maximum lifting capacity of up to 45t. It is distinguished by its hydrostatic transmission, maneuverability, excellent visibility on the workstation as well as the simplicity of maintenance and low fuel consumption. 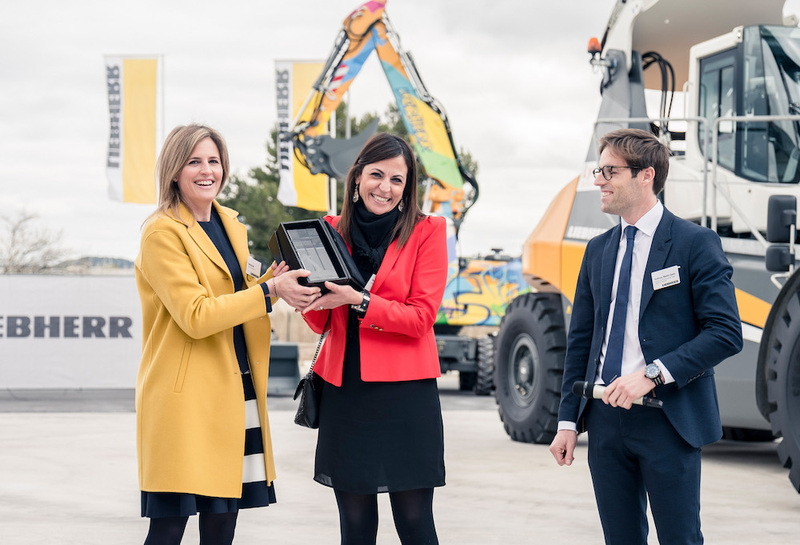 Photo : from left to right : Patricia Rüf, Liebherr Member of the Board of Management / Samira Himeur, Head of Development at Lyon Terminal / Anthony Martin-Garin, Divisional Manager Maritime Cranes at Liebherr France, presenting the keepsake at the branch opening in Rognac, France.